Multiple subpial transections can help to reduce or eliminate seizures arising from vital functional areas of the cerebral cortex. This procedure has been successful in an unusual type of epilepsy called Landau-Kleffner syndrome, at least for a limited time. When seizures originate in part of the brain that cannot be removed, the surgeon may use this procedure, in which a series of small incisions are made that impede the spread of nerve activity. 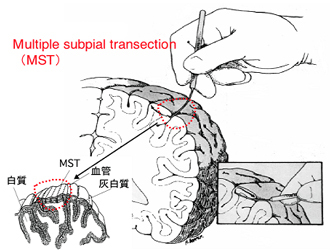 Multiple Subpial Transections stops the seizure impulses by cutting nerve fibers in the outer layers of the brain (gray matter), sparing the vital functions concentrated in the deeper layers of brain tissue (white matter). This procedure is done under general anesthesia.An area of the brain is exposed using a procedure called crainotomy for Multiple Subpial Transections. An incision is made on the top of the scalp, removes a piece of bone and pulls back a section of the dura the tough membrane that covers the brain. A window is created b this in which the surgeon inserts his or her surgical instruments. The surgeon utilizes information gathered during pre-surgical brain imaging to help identify the area of abnormal brain tissue and avoid areas of the brain responsible for vital functions. Using a surgical microscope to produce a magnified view of the brain, the surgeon makes a series of parallel, shallow cuts (transections) in gray matter, just below the pia mater (subpial), the delicate membrane that surrounds the brain (it lies beneath the dura). The cuts are made over the entire area identified as the source of the seizures. After the transactions are made, the dura and bone are fixed back into place, and the scalp is closed using stitches or staples. The patient generally stays in an intensive care unit for 24 to 48 hours after surgery and in a regular hospital room for 3 to 4 days. Part of the scalp and bone will be removed and the dura membrane will be peeled back to expose the region of the brain to be disconnected. During the operation, intraoperative monitoring with intracranial EEG may be done to help the surgeon finely locate and disconnect those and only those portions of the brain causing the seizures. The surgeon will also use a surgical microscope to get a magnified view of the brain and make a series of parallel, shallow cuts in the epileptogenic area. After the operation, the bone will be replaced and the scalp will be sutured closed. Your child will spend a few hours in the recovery room until he comes out of anaesthesia and one or two days in the intensive care unit, followed by about a week at the hospital.